Everest is your next favourite Los Angeles Super Group, consisting of members from other luminary acts such as the Watson Twins, Alaska!, Earlimart, Great Northern, John Vanderslice, and Folk Implosion. Working within the framework of the Ship Collective they’ve quietly been building a following of fans during their time playing together. Their sound is reminiscent of folkier rock acts like Wilco or Calexico, and takes about 5 seconds to get into. Neil Young has listed them in his top 8 acts, and recently signed them to his label Vapor Records. 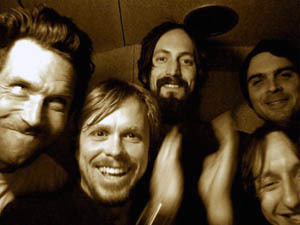 They’re polishing off their first release, a 3 song 45 titled Ghost Notes, at Elliott Smith’s old haunt the New Monkey studio in Van Nuys, California alongside producer Mike Terry (Foo Fighters). They’re also touring lightly and should pick up steam as things move forwards. Check out the track Rebels In The Roses here and some video of their live act below. They also have some stuff available for listening on their MySpace.